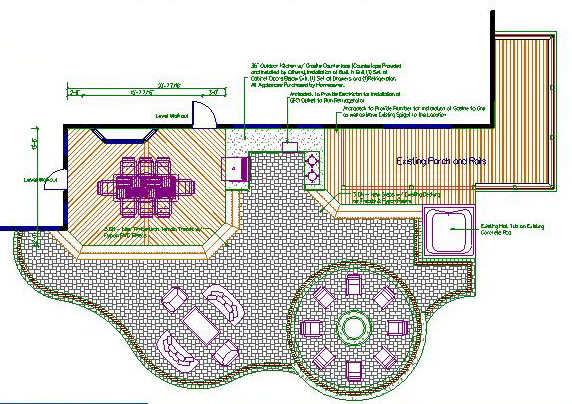 We just put the finishing touches on a design for an outdoor living space that includes everything but a restroom. This Gahanna patio-porch combination will certainly set the standard for entertaining in the neighborhood. We’re very excited to break ground on this project which is sure to see lots of fun in the sun this spring, summer and fall. The curvilinear Unilock paver patio has plenty of room, over 1,000 square feet, for multiple conversation and activity areas. Close to the house it will include a complete outdoor kitchen with granite countertops, a built-in grill and a refrigerator. A second area is designated for relaxed socializing. A third is a circular stone firepit with a retaining wall and plenty of space for chairs. The entire patio also serves as an unifying space which joins the two decked areas. We haven’t settled on exactly which color paver we will use, but intend to use darker, contrasting stones for a framing course along the edge and around the firepit. The flow of the project is ideal. Leaving the rear of the home, guests will emerge onto a low-to-grade deck with no rails. That space is intended primarily for dining, but almost has the feeling of a balcony. From there people can move easily down the grand staircase toward the conversation cluster or off to the side for use the barbecue. The hot tub sits near the firepit and adjoining the covered porch, in case there is a bit of a chill in the air after a quick dip. It’s also just a few steps from the hot tub to the fridge if a frosty beverage is needed. The covered porch is original to the house. This Archadeck endeavor is primarily new construction, but part of the overall building project involves redecking to minimize unnecessary costs while ensuring top-quality and a unified look for the entire space. We’ll use TimberTech Terrain for the new deck with white trim and white risers on the stairs. TimberTech’s CONCEALoc® hidden fasteners will add to the seamless, high-end feel of this Gahanna porch. Another terrific design detail you should note is the way that we were able to integrate the hot tub with both the covered porch and the Gahanna paver patio. You can easily enter the tub from the top rim using the porch, from partway up via the stairs or lever yourself over the side from ground level. As with all of our projects, we consider functionality and fabulous looks for every part of the whole space. Next Next post: Love to spend time in your sunny Columbus OH back yard? Want shade?